It’s taken a very long time for winter to come this year and I’m not complaining. However I have been waiting for my noodle soups; they are one of my favorite categories of food. (Have you ever thought about what your favorite food categories are, as opposed to favorite foods?) Credited for getting me through the freezing cold days, I just love wrapping my hands around steamy bowls bigger than my head. I slurp away my chills with Wonton Noodle Soup, Ramen, Pho, any noodle soup, I love them all! 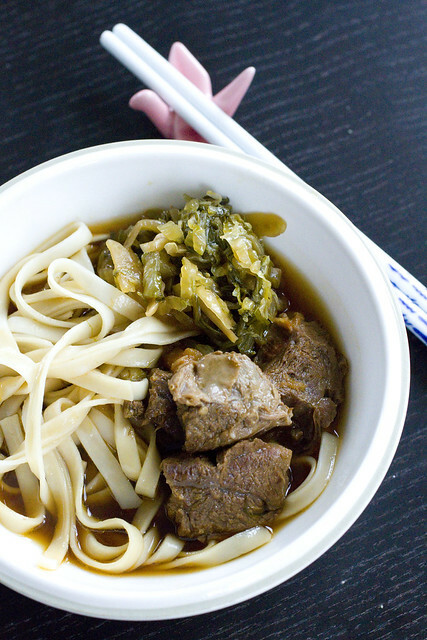 It seems crazy that FoodMayhem is nearing it’s fifth anniversary and yet I’ve never posted the noodle soup I grew up on: Taiwanese Beef Noodle Soup. This is a home-style dish that every Taiwanese family makes and can be found at many restaurants, so it’s one of those recipes for which you can find 500 variations. I wanted to share my mom’s version as it is simple and so good. It hits the spot for me every time. The pickled veggies are not just a garnish, they are absolutely essential to this dish and making that part from scratch does take a little extra work/time, so you can buy the pickled mustard greens at any Chinese supermarket to save effort. 1. My mom taught me to make a concentrated soup for this recipe so that it’s easier to store. Then each time we want to serve it, we adjust with hot water. It may end up looking like you don’t have enough soup at the end of this recipe. That’s what I intended, as long as it’s saltier and concentrated. We think it’s practical. If you want to make it the way you would serve it, simply add more water at the end. It will just take up a little more room in your fridge. 2. You’ll see a lot of “optional” in the ingredients list. This is mostly the spice component. Some people like it without spice; some like it mildly spicy; and, some like it really hot. It’s up to you. You can also make it without spice and just serve chili oil on the table for guests to add on their own. 3. If you would like more veggies in this one bowl meal, people often add spinach, baby bok choy, or choy sum. 1. Bring a large pot of water to a boil. 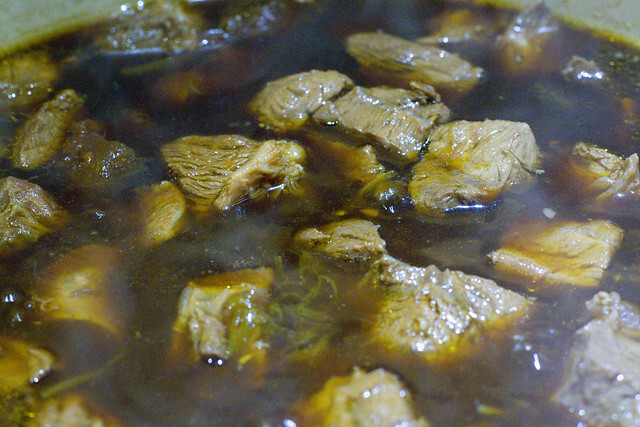 Add the chunks of beef and bring back to a rapid boil, about 5 minutes. Drain and rinse beef with cold water three times, making sure to rinse off all scum. 2. Cut beef into 1″ to 1.5″ cubes, discarding any extra fatty parts. 3. Return to the same pot (after it has been rinsed and dried) and turn to high heat. Add sugar and toss to coat meat. Stir and brown for 2 minutes. 4. Add 1 cup soy sauce, scallions, tomato, ginger, rice wine, and chilies (if using). Stir. 5. Add 5 cups of water or enough to just cover meat. Cover and bring to a boil. Turn down to a simmer and continue cooking for 1 hour. 6. 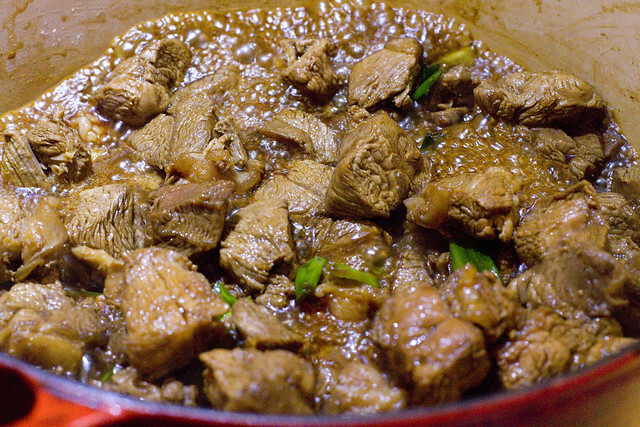 Add water to taste (about 1 1/2 cups) and soy sauce to taste (about 1/4 cup) and simmer for another 10 minutes. *You want it to be a little saltier than you want your soup to be. 7. Add garlic and turn off heat. Leave covered until serving. 8. 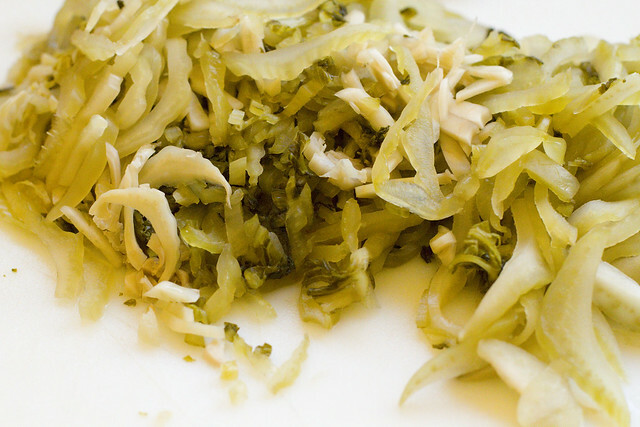 To make prepare pickled mustard greens, squeeze out excess liquid from mustard greens and discard. Heat oil in a wok. Add chili flakes if you are using. Wait 10 seconds and add mustard greens. Stir-fry. Add sugar and toss. Add soy sauce and stir. Add vinegar and toss. Remove from heat. 9. 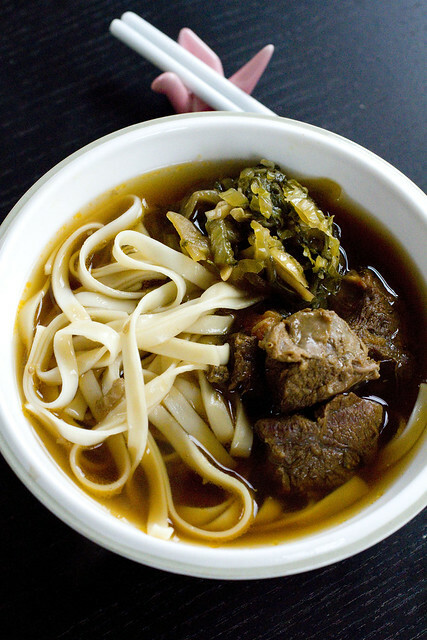 To assemble each bowl of noodle soup you’ll need cooked noodles, beef soup (with additional hot water as needed), and some prepared pickled mustard greens. Add cilantro and chili oil if desired. Store left-over beef soup in the fridge, in an airtight container. Reheat on the stove-top. *You should cook noodles each time you need some. Don’t make a big batch and store. You can store the pickled mustard greens in an airtight container in the fridge as well. posted by jessica	at 05:45 PM	Filed under Chinese, Recipes. You can follow any responses to this entry through the RSS 2.0 feed. Both comments and pings are currently closed. eatingfoodboy, dao shao mien! Where did you have it? Looks delicious! I’ve been craving this recently as well! We just stopped off for lunch specifically to have soup. This looks very hearty and satisfying. I would say soup and salads are a favorite category for me, but not together. I’m either in salad or in the soup mood. And, soup all summer long too, please. I looooove beef noodle soup! I lived in Taiwan for 6 years and ate it at least once a week. I will try your version for sure. I agree that pickled mustard greens must be added. Hilda, let me know what you think! I made the soup this evening to eat tomorrow for dinner. Again I stayed pretty close to your recipe, but I made a couple of changes because it is my wife that I am trying to please here, not follow a recipe verbatim. She raves about her grandfather’s beef noodle soup whose recipe died with him several years ago which I never tasted, so I am shooting in the dark to some degree. Looking at your picture, your soup appears to have been strained, but I saw no mention of that. 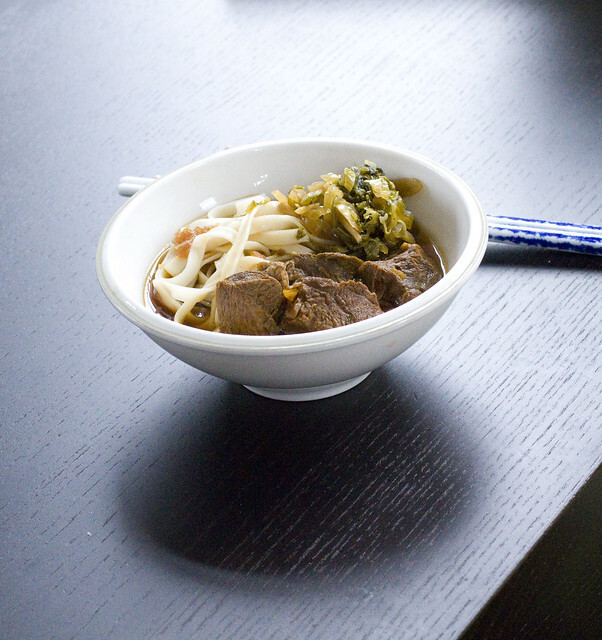 Every beef noodle soup that I have tried has always been a clear brown broth with noodles, meat, and greens, so I strained mine in the end. My wife’s insistence to go with an authentic Taiwanese recipe led us to download and translate several recipes, and seek out the “missing ingredients”. The only addition to your recipe that I took from that was a packet of Taiwanese Beef Noodle Soup seasoning that we picked up yesterday at Kam Man Foods. 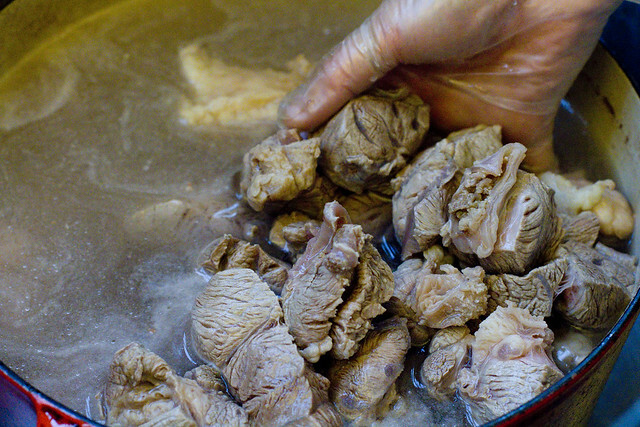 You also made no mention of what to do with the shank bones, which I would believe to hold some additional good beef flavor, so I simmered them with the beef as it was cooking. That made the broth a bit fattier than I believe to be correct, but when I refrigerate the broth overnight, the fat will congeal and I’ll easily remove as much as I see fit. I’ll report on how it comes out when I serve tomorrow. Forgot to post my name to the entry above… My preference is spicy beef noodle soup, and I love the pickled mustard green relish recipe for the Lo Ro Fan. My wife nor my kids are fans of spicy foods, and my wife usually doesn’t like sour pickle flavor. Since I am keeping my Beef Noodle Soup tame, I’ll have to add La-Yu (hot chili oil) and pickled mustard greens only in my serving. Its always a challenge making everyone happy! Marc, beef noodle soup is another one that varies family to family. There’s no “1 right answer” but could your missing ingredient be orange peel? I tasted that at a restaurant once…My version is not strained btw. Also, the reason the shank bones are not mentioned in this recipe is because my mom uses the Chinese cut of shank meat which is boneless when you buy it at a Chinese supermarket. However, I sometimes make this with bone-in shank because I don’t shop at Chinese supermarkets as often and I like the richer soup. I also love it with hot chili oil and pickled mustard greens! Hi Jessica, I got an almost thumbs up from my wife on the beef noodle soup. I could have cooked the beef a little longer as some pieces were not quite tender enough, and she thought it was a little too sweet, maybe use only 1/8 cup sugar instead. I’ll take an almost right for a first try as being largely successful! My bowl was kicking with the healthy spoonful of La-Yu and the pickled mustard greens along with the steamed baby bok choy that I served for my wife and kids. The missing ingredient was a misnomer as she was looking for what was missing before I even tried made it for her. That’s why I only added the Beef Noodle Soup seasoning packet with which the rest of your recipe really worked well. That’s exciting Marc! You could also take it up a notch with fresh hand-cut noodles!